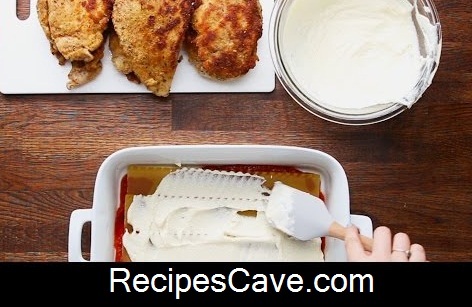 Chicken Parm Lasagna Recipe - Its a new chicken recipe, simple easy and also its tasty to eat. Follow bellow steps to cook chicken recipe. Here is what you'll need to cook Chicken Parm Lasagna to serve 10 peoples. Cut chicken breasts in half widthwise (pound thin if necessary) and season with salt and pepper. Coat the chicken in flour, egg, and finally in bread crumbs. Heat oil in a cast iron skillet and fry the chicken on both sides until brown (about 4 minutes each side). Set aside. In a bowl, whisk one egg into the ricotta, then set aside. In a casserole dish, spread ⅓ of the jar of marinara on the bottom, top with lasagna noodle overlapping with each noodle. Spread half of the ricotta mixture on top of the noodles and layer with chicken. Top the chicken with ½ cup of mozzarella and a ½ cup of parmesan. Continue layering in the same order and top with remaining cheeses. Cover with foil and bake for 45-60 minutes uncovering the lasagna for the last 10 minutes of baking. Your Chicken Parm Lasagna Recipe is ready to taste.